You can download your FREE copy of "The Elegance of Nature: Prophecies of the New World" from Smashwords from April 26 through May 2. 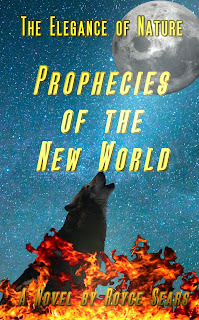 Enter to Win a FREE Kindle Edition or FREE Paperback of "The Elegance of Nature: Prophecies of the New World"
Catastrophe befell Earth seventy-five years ago after an alien virus was introduced, accelerating evolution in wild and unpredictable ways. Humanity has become an endangered species, but an ancient prophecy, a Warrior of the People, and his prophetic vision of an unknown youth may be the keys to healing both the human race and the planet. After being wounded in battle, Otaktay- a warrior of the People- receives a prophetic vision which opens the door to the rediscovery of a lost and forgotten prophecy as old as the first people of North America. With the guidance of the Ma'iingan, he and his band of brothers- the Swooping Hawks- are sent on a desperate race against time to find and rescue the young man foretold by the Prophecy of the Seven Fires. In the New World, survival of the fittest is the rule as the struggle against savage, bloodthirsty predators and shifting paradigms creates an exciting and action-packed adventure where old magic and ancient prophecy shape the future.